In the year 2019, UCLA will be celebrating its Centennial Anniversary, marking one hundred years since our university’s founding. As we approach this impressive milestone, I would like to use Fiat Lux seminars as a forum to showcase some of the great accomplishments of our university to help our students reflect on the rich history and contributions so many have made to the betterment of humanity through research, teaching, and service. Help us reach our goal of offering 100 Centennial seminars by 2019! 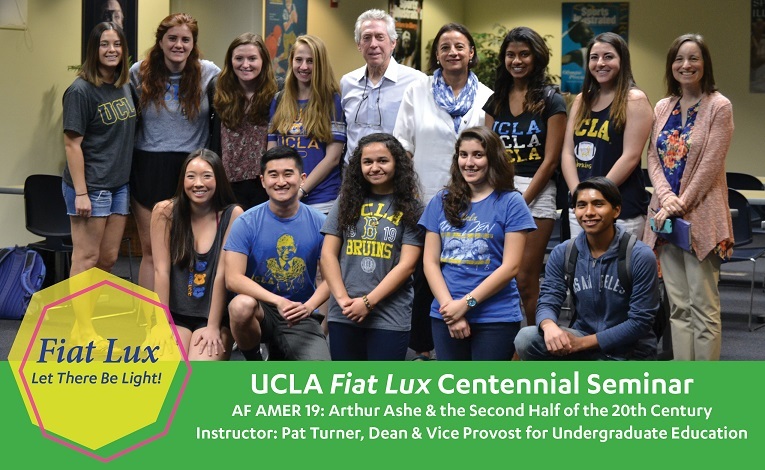 We encourage faculty to develop and teach seminars that fit the spirit of UCLA’s Centennial. If finding a topic is challenging, Beserat Hagos, Director of the Fiat Lux Program, would be happy to meet with you and brainstorm different topics that would fit your area of expertise. Thank you for your consideration and for your continuous commitment that helped us enhance the Fiat Lux program over the past sixteen years.